On Tuesday, a New York grandmother returned to jail on previous charges filed against her for protesting U.S. drone warfare in 2013. 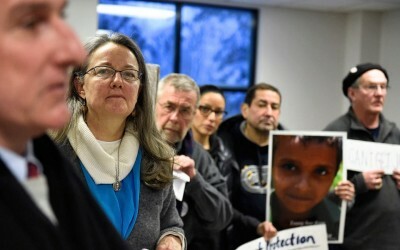 Mary Anne Grady Flores, 58, was photographing other activists as they peacefully protested armed drones at the Syracuse Hancock Air Base in February 2013. Judges in the town of DeWitt, where the base is located, had issued “orders of protection” to activists in order to keep them away from the base. Under these orders, often issued by courts to protect victims of domestic violence, Col. Earl A. Evans, a commander at the base, was construed as a “victim” of the protests. In spite of these orders, Grady Flores and her fellow anti-war protesters continued to assemble to voice opposition to the drone program. Grady Flores is a member of The Upstate Coalition to Ground the Drones and End the Wars, a group that has protested drone warfare since 2011. Though orders of protection were issued to multiple demonstrators prior to the February protest, Grady Flores was the first to be prosecuted for violating one. The other eight activists arrested that day for protesting were acquitted of their charges. Grady Flores, however, was prosecuted for unknowingly moving “beyond what she believed was the base’s boundary” while photographing her fellow activists. “She was later told the base’s property extended into the road,” Amy Goodman of Democracy Now! reported at the time. Grady Flores was charged with second-degree criminal contempt for violating the order of protection. “This has got to stop,” Judge David Gideon said of the activists’ ongoing protests before sentencing Grady Flores in July of 2014. Grady Flores had also refused to pay previous fees and fines imposed by the court. “I find this to be serious because of the continued violations of the orders of this court,” Judge Gideon said. The courtroom was filled with about 100 protesters who came to support Grady Flores. They “walked six miles from the drone base to the courtroom carrying a coffin bearing the words, ‘First Amendment,’” Democracy Now! reported. Though prosecutors in the case did not seek jail time due to Grady Flores’ responsibilities caring for her elderly mother, Judge Gideon forced the punishment, perhaps to make an example of her. He sentenced her to one year in jail — the maximum sentence. She was also fined $1,000. She vowed to appeal, and was released from jail shortly after on a “stay of sentence” after her supporters raised $5,000 to bail her out. That same month, between seven and eight protesters — one of whom was Grady Flores’ younger sister, Clare — were arrested for again protesting at the Hancock base. They demanded the 174th Attack Wing of the Air National Guard, located there, “stay away from the Children of the World and their families, including their homes, schools, places of play and work.” The demonstrators delivered a “People’s War Crimes Indictment,” posting it to a fence after employees on the base refused to take it. In September of 2015, five more protesters — all over the age of 55 — were arrested for trespassing while protesting drones at the Hancock base. Last Tuesday, Grady Flores learned by mail that she was ordered back to jail for her 2013 violation. It happened to be the National Day of Action to Stop Killer Drones. Onondaga County Court Judge Miller had ruled to uphold Judge Gideon’s conviction, and Grady Flores was ordered to return to jail on Tuesday, January 19. Grady Flores is ordered to spend six months at the Jamesville Correctional Facility in East Syracuse NY. The United States’ drone program has faced ongoing criticism for its often imprecise bombings, launched by drone operators far removed from the areas being attacked. A recent investigative report by The Intercept found 90% of casualties from drone strikes were not the intended targets. The Obama administration has previously been accused of and investigated for war crimes for civilian casualties caused by drone attacks. Though the civilian casualty rate is high, a majority of Americans continue to support drone warfare. In the meantime, nonviolent activists are consistently arrested for demonstrating against drones at air force bases across the country.